Our standard service is better than what other local companies call "premium." 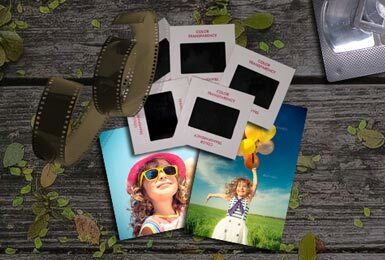 We offer high resolution scanning of slides, photos and negatives with color correction and Digital Ice technology. How high a resolution? Enough for a quality 8x10 enlargement of your original image. Unlike most companies, we don't automatically scan everything at the same resolution. We do what makes sense based on the size of the original image. If you have little wallet-size picture, we'll scan it at a much higher resolution than we would a large portrait. If you need something scanned in even higher resolution, just let us know. We can adjust the settings for your desired purpose. Photographs are scanned at 300-1200 dpi, depending on the size of the original. For example, an 8x10 is scanned at 300 dpi. Standard 4x6 prints are scanned at 720 dpi. Standard 35 mm slides are scanned at 4000 dpi. Need a lower resolution copy of your scans for online use? Just let us know, and we'll be happy to batch convert your scans to a suitable resolution. Images are properly rotated and color corrected. They are checked individually for quality with human eyes, belonging to someone with a compulsion to fix red eye, scratches and graininess. Professional restoration is available for significant scratching, uneven color fading, etc. Digital ICE* technology is a powerful tool for improving images. For slides & negatives, ICE removes dust and dirt, and is absolutely amazing. For photographs, digital ICE aims to reduce the appearance of scratches. For newspaper or magazine clippings, we digitally remove the stippling / halftone dots that show up with consumer scanners. You may choose standard JPEG or uncompressed TIFF files. *Digital ICE is not as effective on Kodachrome slides and some Ektachrome slides. These slides are filtered for dust and dirt manually post scan.